Duck billed platypi live in burrows along eastern Australian and Tasmanian water banks, feeding on crustaceans and plants. With their duckbills, beaver-like tails and webbed feet, naturalists initially believed these strange creatures to be a hoax. 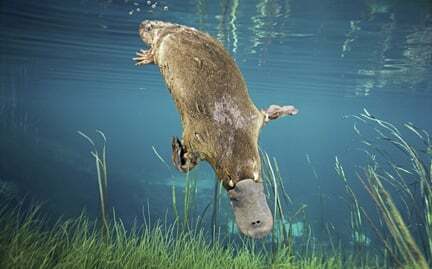 Hunted for fur until a protective law was passed in 1912, platypi are currently threatened by habitat loss and bycatch.